PCSoftUpdate.com pop-up is the PUP that uses misleading techniques to prevent removal. Use Reimage to locate malicious components and get rid of them faster than with uninstall instructions. A full system scan blocks virus reappearance and prevents traffic to malicious domains. How can PCSoftUpdate.com hijack my computer? How to remove PCSoftUpdate.com pop-up virus from my computer? PCSoftUpdate.com is yet another advertising platform that has been used for showing people commercial ads during their browsing. Unfortunately, but not each of these ads can be trusted because there is one category of PCSoftUpdate.com ads that are used for spreading adwares, browser hijackers and similar PUPs. 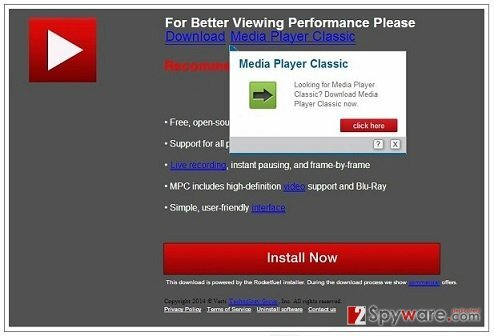 These ads are set to inform PC users about missing updates and required programs, such as Java, Flash Player, FLV Player, one of web browsers, etc. As you can imagine, this platform has nothing to do with updates for legitimate software. In fact, you should stay away from its ads if you want to protect yourself from adwares and browser hijackers. How could you get rid of ads by PCSoftUpdate.com? The answer is very simple – these pop-up notifications are closely related to adware-type programs that have been actively spread in a bundle with freeware and shareware. If you have just installed a download manager, a PDF creator, video streaming software, video recording software or similar free application, there is no surprise that these fake ads are following you while you are browsing on the web. Once PCSoftUpdate.com virus infiltrates computer, it starts showing different notifications about missing updates that should never be trusted. In addition, you can also be offered to call for free support service and receive a free assistance for removing viruses. Please, do NOT fall for such support scams because they are seeking just to trick people into downloading fake security software on their computers. Of course, such services are usually not free, so if you don’t want to receive a greatly increased telephone bill, you should avoid them. Beware that all these messages are filled with tempting headlines and well-known names. If you do not want to get in trouble, you should avoid them and remove questionable software from the system. For that you can use Reimage or other reputable anti-spyware. You may start seeing such and similar annoying ads or misleading notifications out of nowhere. In fact, you should think what free program have you just installed on your computer because these ads are usually displayed right after installing a questionable freeware. PCSoftUpdate.com virus and adwares that are associated with this platform may disguise as regular toolbars, add-ons and similar extensions for your internet browser. That is the main reason why we highly recommend installing a reliable, trusted and updated anti-spyware program. However, if your PC is unprotected, you should take some extra time and check every single program that you want to install. Moreover, you should avoid downloading such programs as YouTube Video Downloader, Download Manager 2.1, PDF File Converter, HD-Video Codecs, etc. because these programs may carry PCSoftUpdate.com virus. Furthermore, if you are installing a freeware, try to find as much information as possible about this program that you are about to install. PCSoftUpdate.com ads can be extremely annoying and even trick you to download a potentially unwanted program. If you want to remove this intruder, this removal tutorial should help you. Here, look for PCSoftUpdate.com pop-up or any other recently installed suspicious programs. Wait until you see Applications folder and look for PCSoftUpdate.com pop-up or any other suspicious programs on it. Now right click on every of such entries and select Move to Trash. When in the new window, check Delete personal settings and select Reset again to complete PCSoftUpdate.com pop-up removal. Once these steps are finished, PCSoftUpdate.com pop-up should be removed from your Microsoft Edge browser. Here, select PCSoftUpdate.com pop-up and other questionable plugins. Click Remove to delete these entries. Now you will see Reset Firefox to its default state message with Reset Firefox button. Click this button for several times and complete PCSoftUpdate.com pop-up removal. Here, select PCSoftUpdate.com pop-up and other malicious plugins and select trash icon to delete these entries. Click Reset to confirm this action and complete PCSoftUpdate.com pop-up removal. Here, select Extensions and look for PCSoftUpdate.com pop-up or other suspicious entries. Click on the Uninstall button to get rid each of them. Now you will see a detailed dialog window filled with reset options. All of those options are usually checked, but you can specify which of them you want to reset. Click the Reset button to complete PCSoftUpdate.com pop-up removal process. ¿Qué es El virus PCSoftUpdate.com? This entry was posted on 2015-09-21 at 03:15 and is filed under Adware, Viruses. You can quickly scan the QR code with your mobile device and have PCSoftUpdate.com pop-up virus manual removal instructions right in your pocket. How did you remove PCSoftUpdate.com pop-up virus?